It almost feels as if a hotel is opening in Barcelona every other day. 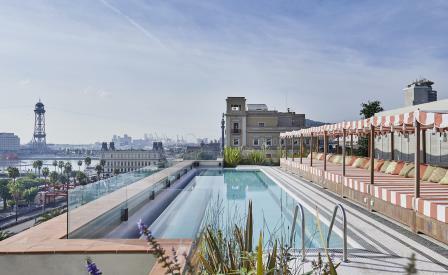 The latest to surface over the radar is the latest outpost of Soho House in the city’s lively Gothic Quarter. And that is probably the secret to the group’s stamina – an unerring sense of a city’s sweet spot, here manifested by an unbeatable proximity to the Palau Güell museum, La Basílica de la Mercè, the Colombus monument, buzzy Las Ramblas and the Mediterranean sea, alongside a casual haul of boutiques, tapas bars and vintage stores. Nick Jones and his in-house team have transformed a heritage-listed 19th-century block of apartments into a slick 57-room retreat with a sleek roof top pool and views over the Port Vell marina. If you detect a soft Moorish hint in the décor, it’s because the mood board is littered with classic Catalan references by way of exposed brick ceiling vaults, local ceramic tiles, vintage bronze fittings and mosaic floors and bar tops.